River and Stephen’s love story has been featured in Grace Ormonde Wedding Style, a highly prestigious publication. We are delighted to have received this great honor, and are inspired to share their love story with you. The epic love story of psychic River Zhong and Stephen Cheung is centuries in the making. Stephen, a courageous Chinese general, fell in love with River’s beauty and fiery spirit instantly during a past life. As a result of war, the two lovers were to be separated for another 300 years. Their destiny was ultimately fulfilled when River’s Godmother, serving as the couple’s matchmaker, recognized that the two lovelorn souls were fated for sweet reunion. Upon formal reintroduction, the blissful couple were astonished to have finally found one another, vowing not to allow life nor death to keep them apart. Within four short months, the couple had arranged an intricate Chinese engagement ceremony to allow Stephen to formally request that River become his bride. During the ceremony, the couple’s matchmaker negotiated the dowry between each set of parents, which consisted of yellow gold jewelry that was placed on the bride-to-be by her future mother-in-law. The bride’s family also presented gifts to the groom and his parents as part of a special tea ceremony, including a money-filled red envelope symbolizing a blessing and formal welcome into the new family. River and Stephen own two successful restaurants in the Washington D.C. Metropolitan area ¾ Lavagna, offering fresh farm to table Italian cuisine, and Pow Pow, serving up delectable Chinese American dishes. The couple later celebrated their engagement during a party with family and close friends at Lavagna Restaurant. River and Stephen planned for their wedding to carry as much symbolism as their engagement festivities. 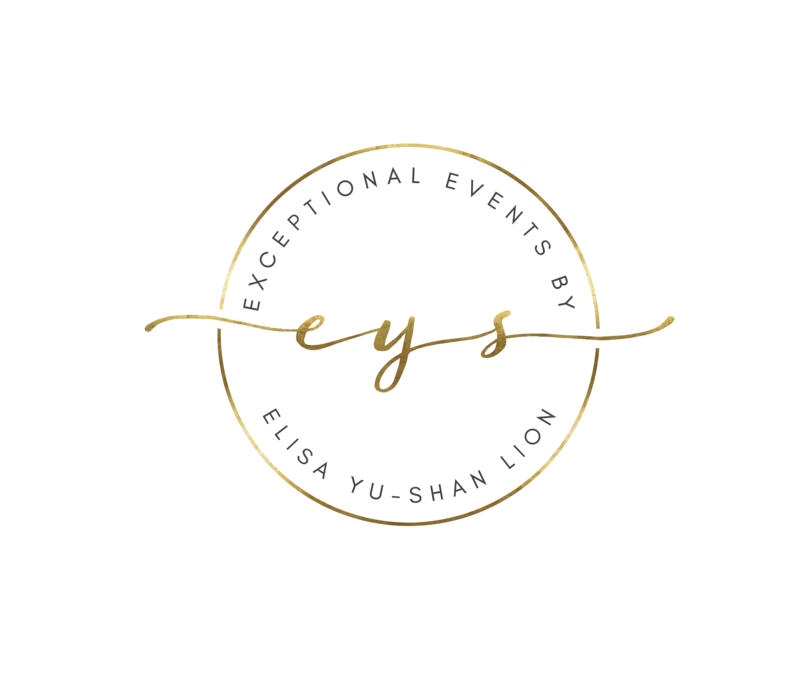 River’s psychic abilities led her to hire me – Elisa from Exceptional Events by Elisa to plan, design, and coordinate the day of the wedding with great attention to symbolism and detail. 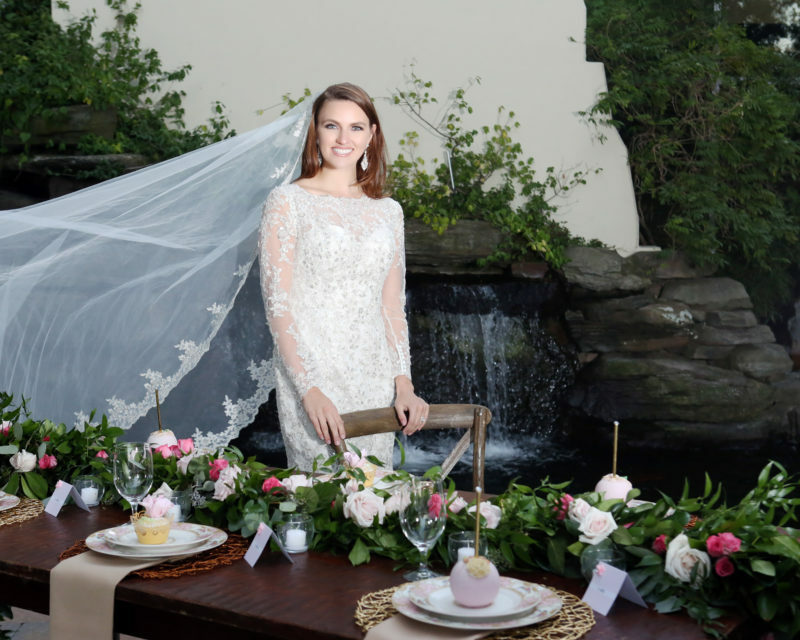 The bride chose a complementary set of award-winning event professionals to round out the team, including Butterfly Photography, Brookhill Florist, and Bowen Films. As restaurateurs and foodies, the couple chose to celebrate their nuptials at the highly acclaimed 2941 Restaurant. River and Stephen’s ceremony was attended by close family and friends, and was gracefully framed by koi ponds, waterfalls, and a lakeside view. The ceremony and reception décor were accented with touches of gold to symbolize wealth, along with purple and cream florals, desserts, and favors. The color red played a vital role in their Chinese celebrations as a symbol of success, love, loyalty, fertility, and honor. 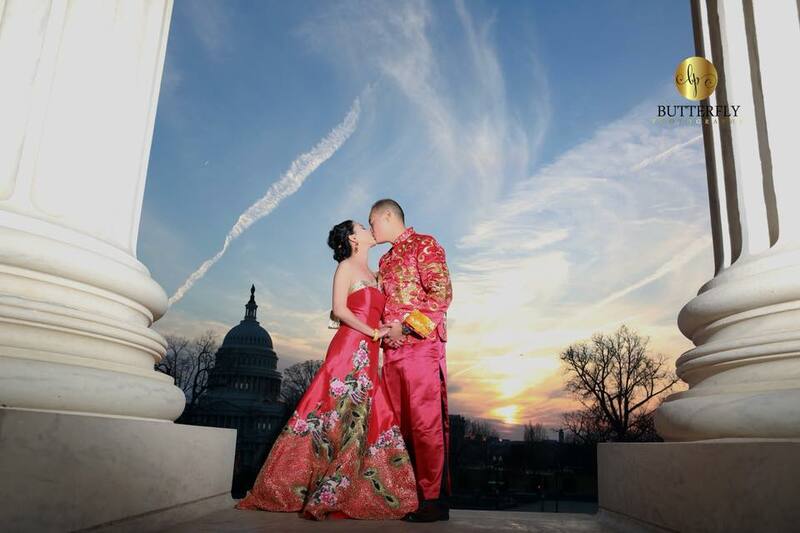 The couple stunned in their engagement pictures with vibrant red Chinese apparel. River wore gilded red heels for the wedding ceremony along with an American-style lace wedding dress. She changed into another white dress with a delicate embroidered cape for the reception, as is traditionally done in Chinese culture to highlight the bride’s beauty. Multiple tea ceremonies served to honor the couple’s parents and officially usher the bride and groom into their new family. River and Stephen were delighted with the flawless outcome of their day, and they felt that their wedding was perfectly fit for a love written in the stars. The joyous couple soon enjoyed a relaxing, tropical honeymoon with family in Miami to continue with the festivities. They will be planning a second, traditional Chinese wedding to take place in China at a future date. River and Stephen are in agreement that their spectacular wedding and newfound happiness were worth the centuries-long wait. 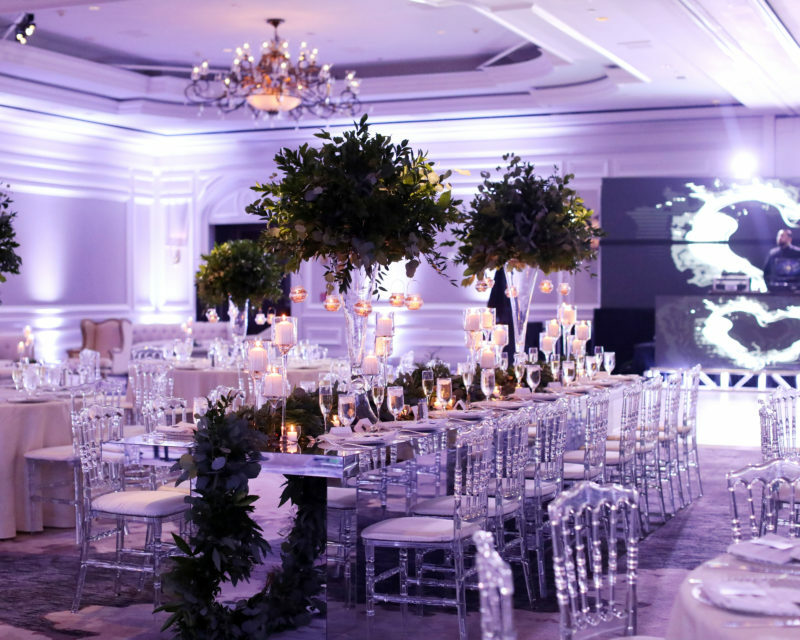 Grace Ormonde Wedding Style is dedicated to offering its readers innovative ideas and creative approaches from the world’s top wedding specialists. Recognized with prestigious industry awards for its superb printing and design quality, Grace Ormonde Wedding Style blends meaningful editorial content with select advertisers. Grace Ormonde Wedding Style is the most talked about luxury wedding magazine worldwide. Be sure to look for the exquisite spread featuring Leo and Bill’s wedding in the most recent issue of the magazine!